Standard or balloon wheels and tyres for kite buggy, land yacht and general beach trailer use. 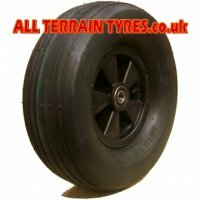 We have listed the most popular tyre and wheel combinations for kite buggies, but if you don't see what you need, please ask. Our range of beach wheels with balloon tyres offer greatly reduced rolling resistance over standard boat launching trolley wheels, and in most cases will fit directly onto your existing axles when fitted with the correct wheel bearings - the plastic wheels are impervious to salt water and can be fitted with stainless steel ball bearings if necessary.